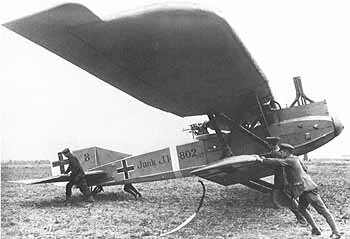 The Junkers J.I (manufacturer's designation J 4, not to be confused with the earlier, pioneering J 1 all-metal monoplane of 1915/16) was a German sesquiplane format warplane of World War I, developed for low-level observation and ground-attack. It is especially noteworthy as being the first all-metal aircraft to enter mass production. It was a slow aircraft, but its metal construction and heavy armour, which comprised an extremely advanced, single-unit armoured "bathtub" that ran from just behind the propeller to the rear crew position, and acted both as the main fuselage structure and engine mounting setup in one unit, was an effective shield against anti-aircraft artillery. The experimental developments were interrupted by the breakout of World War I in August 1914. In May 1915, Junkers achieved a test order for the further development of his all-metal aircraft by the German War Ministry, when delegates of this Ministry visited the Dessau "Jco" (Junkers Company) plants. In September 1915, the production of the J 1 pioneering all-metal monoplane prototype began at Dessau, and at the beginning of December 1915, the first Junkers aircraft was finished. The armoured "bathtub" concept of the J.I, because Hugo Junkers had to move his aircraft manufacturing equipment out of Germany into the Moscow suburb of Fili in the Soviet Union during the 1920s, could have been noticed by Sergei Ilyushin and remembered by him, when his design bureau worked on the similarly-equipped Ilyushin Il-2 Shturmovik Soviet ground-attack aircraft of World War II. It was well-liked by its crews, although its ponderous performance earned it the nickname "Furniture Van". They were used on the Western Front during the Kaiserschlacht of March 1918. There were 227 J.Is manufactured during the war. Only one aircraft survived, bearing German military serial number J.I 586/17 and preserved at the Canada Aviation Museum in Ottawa.